Northamptonshire are 234/0 at the end of the second day of their Specsavers County Championship match at Sophia Gardens after Glamorgan declared at lunch on 570/8. Northamptonshire were 105/0 when play resumed and thanks to boundaries off the first two balls of the session by Ricardo Vasconcelos against Marchant de Lange, the visiting batsmen had further reduced the deficit. Marnus Labuschagne continued his frugal spell at the Cathedral Road End and nearly claimed his first wicket as Vasconcelos chipped a ball back just out of the reach of the Australian. Vasconcelos also pulled de Lange for four whilst the watchful Rob Newton continued his patient accumulation in singles before square-driving Timm van der Gugten en route to a 137-ball fifty. Charlie Hemphrey’s off-spin was also introduced in a bid to break the opening stand, as well as the return of Graham Wagg. But the pair continued their stand with Vasconcelos reaching his hundred by square-cutting his 189th ball for four after Newton had advanced down the wicket to Hemphrey and lofted him over mid-on, followed next ball by a sweep for four. The 200 came up in the 62nd over with Vasconcelas also twice guiding de Lange to the vacant third man position before hooking him for six erasing the previous best opening stand by the East MIdlands side against Glamorgan, set by Ben Duckett and Luke Procter who added 208 at the same ground last summer. With Glamorgan having declared at lunch on 570/8, Michael Hogan and Graham Wagg opened the bowling after the interval, with Ricardo Vasconcelos clipping the Australian to square-leg for four in the opening over before cover-driving him in Hogan’s second over and finding the ropes at square-leg again in the bowler’s fourth over. Rob Newton then glanced Wagg to the ropes at square-leg before Marchant de Lange entered the fray in red ball cricket for almost a year. He nearly claimed a wicket with his ninth delivery as an edge from Vasconcelos evaded the grasp of second slip. Much to the bowler’s ire, he then edged through the slips two balls later. Timm van der Gugten then replaced Wagg and was on-driven for four by Vasconcelos as the 50 came up in the 15th over. The opener then cover drove de Lange for four before clipping van der Gugten to fine-leg for another boundary before completing his fifty by square-cutting the Dutchman. Newton also did the same the next over, but the ball only just cleared the head of the fielder at backward point. Vasconcelos also clipped David Lloyd to fine-leg before Marnus Labuschagne had his first spell in Glamorgan ranks shortly before tea at the Cathedral Road End. 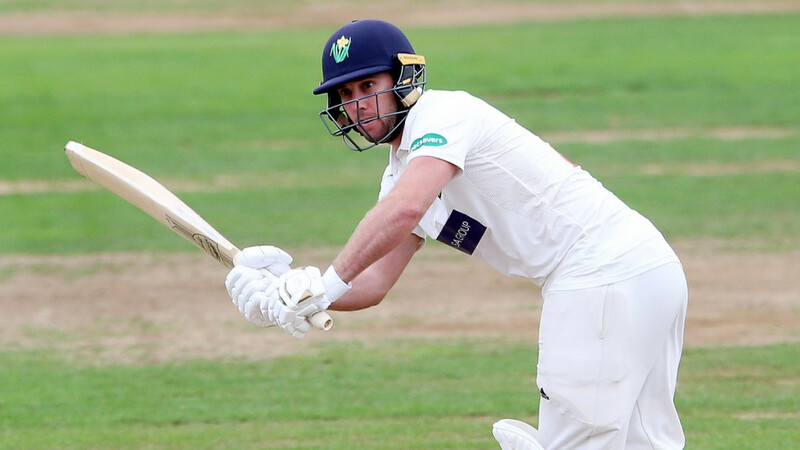 It was quite an opening day yesterday for Glamorgan to the 2019 Championship season, with three of the Welsh county’s batsmen posting centuries as they enjoyed their best day with the bat in the competition for 29 years, as Marnus Labuschagne, Billy Root and Kiran Carlson emulated the feats of Hugh Morris, Matthew Maynard and Viv Richards who all scored hundreds on August 11th, 1990 on the opening day of Glamorgan’s Championship match against Nottinghamshire at Worksop Town CC. When play resumed this morning, Billy Root was eight runs away from a career-best score, and together with impish Kiran Carlson, was looking to further extend their stand which had already amassed 172 in 29.3 overs. But Root departed to the fourth ball of the day as he square-cut Luke Procter into the hands of Ricardo Vasconcelos in the gully. Chris Cooke duly joined Carlson and began with a pair of booming on-drives against Procter before Carlson was dropped by Alex Wakely at slip in Ben Sanderson’s opening over, but the visiting captain atoned next over as he safely pouched an outside edge from the young tyro’s bat as Nathan Buck claimed his second scalp. 457/6 saw Graham Wagg join Cooke who cover drove Sanderson with aplomb before Wagg greeted the return of Blessing Muzarabani by straight-driving the Zimbabwean for another boundary, followed next over by a pull for four and a deft leg-glance against Sanderson. But the bowler gained revenge later in the over as he re0arranged Wagg’s stumps. With Marchant de Lange as his new partner, Cooke pulled Jason Holder’s first delivery of the day for four. After nurdling a single, de Lange then lofted Rob Keogh for six into the River Taff, with Cooke then taking Glamorgan to the 500-mark by on-driving successive balls from Procter for four. Just for good measure de Lange did the same but next over miscued a pull against Jason Holder and was well caught by Muzarabani running back from mid-on. Timm van der Gugten joined Cooke and lofted Keogh for four before Cooke also opened his shoulders and plundered a series of legside blows including a massive six to square-leg as he reached his fifty from 79 balls. A further series of blows saw him reach 70 at lunch whereupon Glamorgan declared on 570/8 - their highest-ever total in Wales against Northamptonshire, surpassing their 556/7 at Sophia Gardens in 2001.